Our Sunday services all center around Holy Communion (also called Eucharist), when we bless bread and wine in the name of Christ and share them as a sign our of unity and a source of strength. Everyone is welcome to receive Communion at our altar; we believe it is how God feeds us so that we can grow in love. The Eucharist, a word that means “thanksgiving”, has two major parts, the liturgy of the Word and the liturgy of Communion. One might go so far as to call them two “acts” in a drama with each participant playing their vital role. In the first act we are reminded of our place in God’s story as the scriptures are read, a sermon is preached, prayers are said together, and as we offer a common confession and are reminded of God’s forgiveness. In the second act we experience afresh God’s acts of redemption as we see the bread broken and the wine poured out and share in these elemental representations of God’s presence with us. Finally, we are sent out bearing that presence and our common story to the world. At 8:00 a.m. there’s a quiet, contemplative Eucharist without music. At 9:00 a.m., our family-friendly Choral Eucharist brings us great music and challenging preaching. A concurrent Children’s Chapel allows our littlest members to hear the Gospel in an age-appropriate way, to sing and dance and wiggle, and then join the “Big Church” for Communion. The Teen Service Fellowship offers an intimate and trusting worship alternative for teens; of course, people of all ages are always welcome in any of our services. At 11:15, our Spanish-speaking members gather in the Little Sanctuary with some of their English-speaking friends for a joyful celebration of Holy Eucharist with music from the Latino tradition. During the summer, this service is held in the main church. The 11:15 a.m. Choral Eucharist is a more formal service, with great music and pageantry and traditional language during the seasons of Advent, Christmas, Lent, and Easter. People of all ages are welcome. The 8:00 a.m. lasts about 40 minutes, the 9:00 runs about an hour, and the 11:15 services last about an hour and ten minutes. On Sundays there’s free parking on Wisconsin Avenue, Garfield Street, the side streets and in the Cathedral garage. There are two handicapped spaces on the road that runs on the south side of the church, opposite the entrance ramp. Parking is also available on Sundays in the lot below the Cathedral. Just drive under the lychgate (the entrance to St. Alban's from Wisconsin Avenue) and keep going down the hill on Pilgrim Road. Yes! We have children’s chapel at 9:00, a teen service fellowship at 9:00, and Christian formation classes for all ages from 10:15-11:00. To see which classes are right for your children, click here. For youth grades 6 to 12, click here. There is no dress code. Some people dress up in their Sunday best and others show up in khakis or yoga clothing. The important thing is that you are with us, not whether you are perfectly pulled together. Yes! 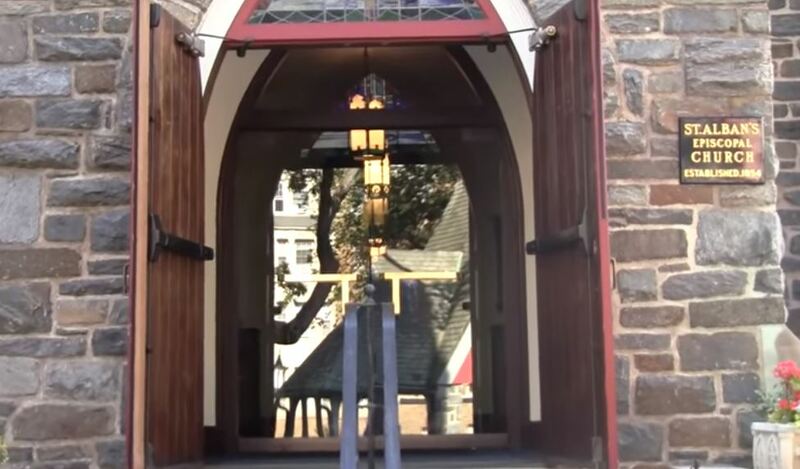 We are wheelchair accessible, with a ramp leading to the front entrance of the church. Large-print worship resources and hearing-assist devices are available from the ushers.